So, do you have planner peace? I remember the first time I heard that term and wondered, "what the heck is that?" Since then I have come to realize that it means different things to different people. Some are talking about the looks of their planner (size, stickers, accessories), while others are focused on the function of their planners. 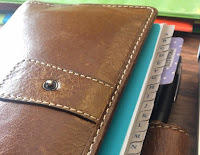 As far as looks are concerned, I am quite content with my personal size Malden, but as a functional planner, planner peace consists of having the right elements to take care of my day-to-day use. 1. A-Z divider tabs - I recently bought a set of Franklin Covey A-Z phone tabs to fit the size of my planner (compact size) and it works better than the half size tabs that I had cut down to size. These tabs are used as a filing system of sorts where I record account numbers, passwords, makeup shades, grocery list blanks, random lists (chores, wishlists, etc. ), and more. Some of the information goes directly on the dividers, some is written on a sticky note and put on the correct divider, and some things are hole-punched and put behind the correct tab. This idea works for me because I don't like a ton of tabs and when I need to add new information, I can just file it away behind my a-z tabs. 2. Daily Pages - To be honest, I did not start out as a daily page kind of girl. I almost always had room on my week on 2 pages horizontal spread to plan out my week. Only when there was a particularly busy day did I pull out a daily page, but this year things have changed. This is my first year using daily pages from Franklin Covey and I have liked them even more than I thought I would. As a matter of fact, I'm not using weekly pages at all. As you might already know, FC has a prioritized task list and schedule on one (left) page and a daily notes section on the second (right) page. My biggest concern in the past is that I didn't need all that space and that I wouldn't know what to write on it. Gosh, that's changed. I've quit using sticky notes to write my quick trip shopping list and jot it down on my notes page instead. On Friday's I write my menu on the note page. Sometimes I keep church notes on Sunday. Sometimes I flip back to find a near-empty note page and I'll doodle. At the end of the day, if it is still empty, I'll journal about my day. I'm finding there are all sorts of things to write on a note page. 3. Monthly Pages - I once experimented with a month on one page and didn't like it at all. I think I will always be a month on 2 pages girl. This year I am using FC's monthly calendar and really loved the built-in month tabs. They are tiny and not in the way at all. 4. Zippered pouch - my planner has pockets to put cards, etc. in but I really wanted something that I knew for sure would be secure, so I store stamps, sometimes cash, and an extra bookmark for my pagefinder with a pouch. If I have these things in my planner, I'm at peace with whatever planner I am using. What are your must-have elements in your planner?